MARTINSBURG, W. Va – Forty-three years ago, as the North Vietnamese Army and the Viet Cong took over the South Vietnam capital city of Saigon, thousands of refugees fled their home country and the communist government. Many found their way to the United States. Air Force Tech. Sgt. Michael Thompson’s mother was one of those refugees. Thompson, an electronic integrated systems mechanic for the 167th Airlift Wing’s communications, countermeasures and navigation systems section here, said his mother’s journey to the United States started with one member of the Air Force who sponsored her, her two sisters and their mother. It was that one airman who inspired Thompson to join the military as a member of the West Virginia Air National Guard. In April 1975, two years after the U.S. had pulled combat troops out of Vietnam, it became clear that the communist party would take over South Vietnam. 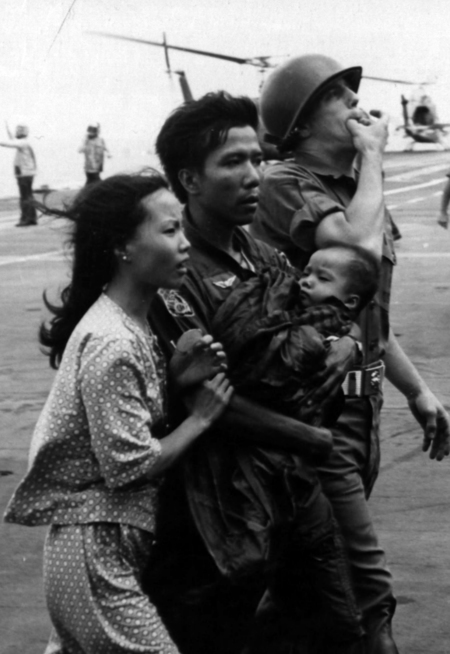 Americans, as well as Vietnamese who were deemed at-risk if they remained in the country, were evacuated en masse. Thompson said his mother, not quite a teenager then, recalls the evacuation. “She remembers them frantically loading people onto a C-130 and then high-tailing it out of there as fast as they could. They [and] the plane, were being actively attacked from the ground when they were leaving,” he said. Without the sponsorship of that one member of the military, a man who befriended his grandmother in Vietnam, it’s unlikely his family would have made it out of the country and to the small town of Shepherdstown, West Virginia, where they settled after leaving their home. Thompson said his grandmother went to work in a factory to provide for her daughters and eventually bought a house. Thompson said he had always hoped to join the military, but his mother, because of her experiences in Vietnam, tried to dissuade him. Instead, she pushed him to focus on his studies and to perform well in school. “I think I had a very strict upbringing but compared to what she went through, my childhood was a vacation. I only had to worry about doing chores and homework. She had to worry about dodging landmines on the way to school. It puts things into perspective,” he said. Sign up for our emails to stay connected to the USO and the troops we serve. When Thompson graduated from high school in 2003, he chose to study engineering. “In high school, I thought about all of the jobs that really make a difference and as I narrowed down the list it became engineering or the military. I saw both as having end results that make a difference,” Thompson said. Thomas attended engineering school in Flint, Michigan, and then moved to Chicago during his last two years of college for an internship at a large wealth management firm. After completing college and the internship, he said he felt unfulfilled and the call to serve his country had not quieted. Thompson left Chicago, returned home, and told his mother he was joining the military. His mother’s views on the military had softened by this time. She had taken a job at a bank, which was located on the 167th Airlift Wing’s installation at the time, and got to know many of the members of the wing. Thompson said a former first sergeant for the 167th Logistics Readiness Squadron and family friend helped him transition into the wing. After nearly 10 years in the career field, he said he still enjoys his job. “We get the ball rolling here so that stuff can happen out there,” Thompson said, in explaining how his job here at the wing ensures deployed airmen and soldiers get the supplies and equipment they need. -This story was originally published on Defense.gov. You can help our heroes with the little things that will mean so much this year like a phone call home, comfort foods or a place to relax. Given the T-shirt’s widespread popularity and its prominence in modern fashion, it might seem surprising that before World War II, the garment was considered a piece of underwear and was almost never worn on its own. To help military and civilian kids find positive, productive and cheap ways to stay busy during the warm summer months, we put together a list of nine fun crafts that anyone can do at home. All you need is an old T-shirt or two. No matter where you go on July 4, you can show your support by wearing your USO Force Behind the Forces T-shirt and expressing your gratitude for our men and women in uniform. Be the first to learn about news, service member stories and fundraising updates from USO. The USO relies on your support to help service members and their families. Download our app to find events, locations and programs near you. The USO is a not-for-profit organization and not part of the Department of Defense (DoD). The appearance of DoD visual information does not imply or constitute DoD endorsement. ©2019 USO, Inc. All Rights Reserved.